We are a cleaning company that will clean every single stain of your carpet. Our services include vacuuming, deep fabric cleaning, textile-friendly treatment, disinfection and perfuming. Mold stains, wine spills, food remains, mud and everything is not a problem at all. Once we are done with your carpet you will want to sleep on it rather than on your bed. Call us now. The web server used by Cleanerspaddington.net is run by Telecitygroup International Limited and located in Great Britain. This web server runs 8 other websites, their language is mostly english. 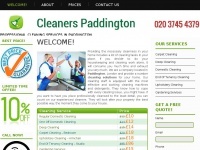 A Apache server hosts the websites of Cleanerspaddington.net. For managing the data of the webpages the CMS WordPress in the version 4.9.8 is used. The website uses the latest markup standard HTML 5. The website does not specify details about the inclusion of its content in search engines. For this reason the content will be included by search engines.